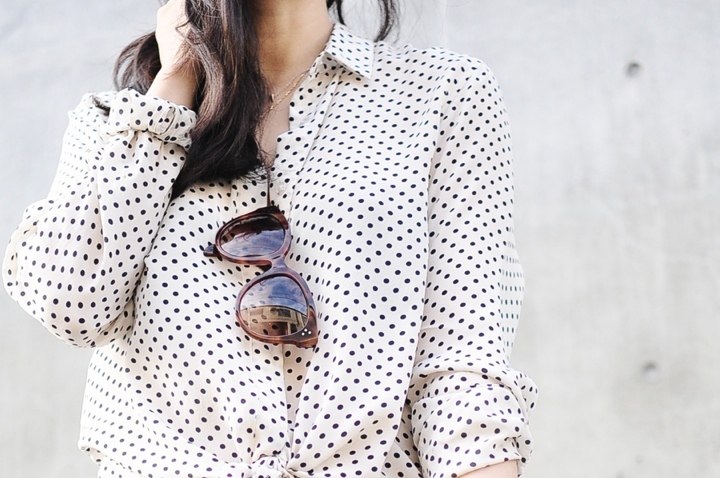 i feel like polkadots is a pattern that can be worn all season long. remember when i wore these polkadot denim pants? i love how i can pair it with different textures and fabrics like leather, knits, cotton...it practically goes with anything. plus, wearing polka dots puts me an upbeat mood. well, this outfit could have looked a bit more everyday like if i just tucked my shirt in. but, i wanted a more feminine look so decided to tie the two ends of my blouse. this is a quick and easy way to feminize your blouse. love this. It's so perfect. Love the polka dots! I'm thinking a pretty, feminine blouse like that must become a part of my spring wardrobe. I saw that photo of your photographer/partner and thought you two looked adorable. He definitely deserves some recognition for all the wonderful shots he takes. You two make a great team!